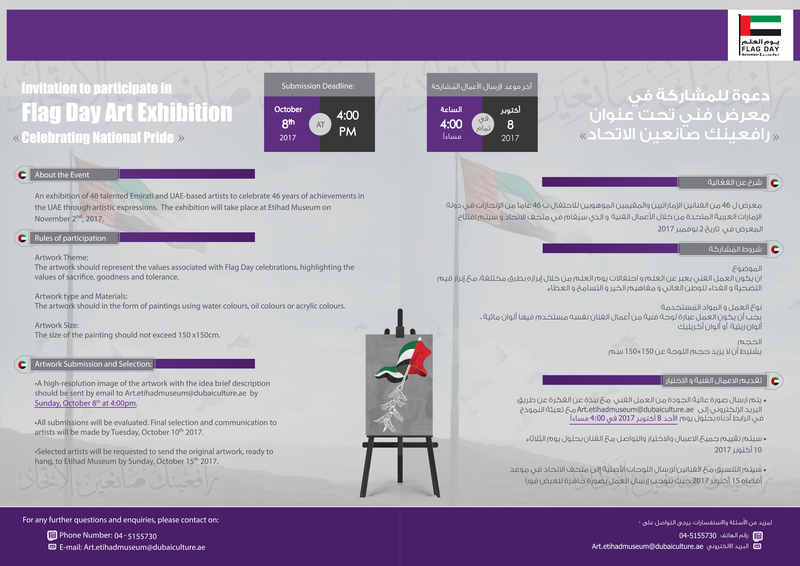 An exhibition of 46 talented Emirati and UAE-based artists to celebrate 46 years of achievements in the UAE through artistic expressions. The exhibition will take place at Etihad Museum on November 2nd, 2017. The artwork should represent the values associated with Flag Day celebrations, highlighting the values of sacrifice, goodness and tolerance. The artwork should in the form of paintings using water colours, oil colours or acrylic colours. The size of the painting should not exceed 150 x150cm. •A high-resolution image of the artwork with the idea brief description should be sent by email to Art.etihadmuseum@dubaiculture.ae by Sunday, October 8th at 4:00pm. •All submissions will be evaluated. Final selection and communication to artists will be made by Tuesday, October 10th 2017. •Selected artists will be requested to send the original artwork, ready to hang, to Etihad Museum by Sunday, October 15th 2017. Is digital art available ?